This article is one in a series at The 74 that profiles the heroes, victories, success stories and random acts of kindness found at schools all across America. Read more of our recent inspiring profiles at The74Million.org/series/inspiring. 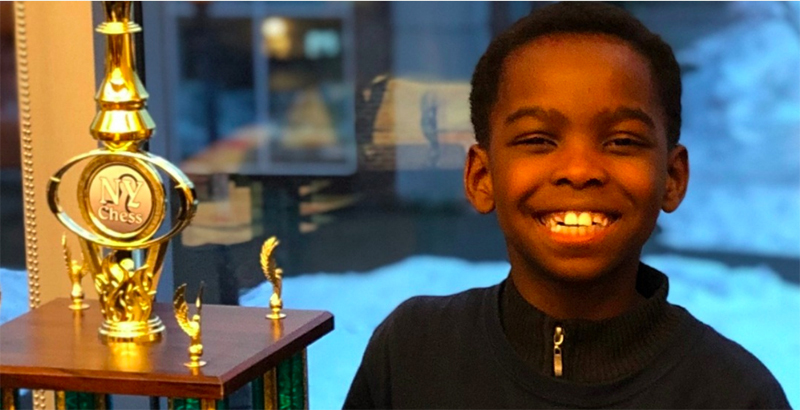 The champion of this year’s New York State K-3 chess tournament is a rather unlikely competitor. He’s an 8-year-old Nigerian refugee who moved to the U.S. just two years ago. And he learned to play this deeply analytical and strategic game only last year — while living in a homeless shelter. But Tanitoluwa Adewumi — Tani — won the championship title for his age division in March because of his continued determination in both developing his chess prowess and overcoming adversity. Fleeing religious persecution in Nigeria, the Christian family of five found refuge in Manhattan in 2017. A pastor connected them with a homeless shelter and the local elementary school, P.S. 116. There, Tani took a keen interest in the school’s chess club. After his mother, Oluwatoyin, emailed the administrators and explained the family’s financial situation, the club’s leader, Russell Makofsky, waived the membership fee. Tani learned the rules of the game, and though he started as the club’s lowest-performing player, according to The New York Times, he quickly rose to the top of the ranks. His rating is now 1587; for comparison, the world’s best player is at 2845. After school, the third-grader would set out his chess board and arrange the pieces on the floor of the homeless shelter. Every Saturday, his mom would bring him to three-hour practice sessions, and in the evenings his father, Kayode, would let him use the family’s laptop to further hone his skill. The school also championed Tani’s chess abilities. According to USA Today, a student gave him a chess clock, and the Times reported that P.S. 116 Principal Jane Hsu held a pep rally in Tani’s honor. “It’s an inspiring example of how life’s challenges do not define a person,” Hsu told the Times. When tournament time came, Tani cemented his reputation as a chess prodigy. He didn’t lose a single game in the tournament, according to The Today Show, and brought home a trophy half his size. The 1200-player New York State Scholastics are underway in Saratoga. But Tani’s heartwarming tale didn’t end there. Since the account’s creation on March 15, the goal has been met four times over, raising more than $246,000. And now, Tani has a home. A follow-up New York Times article explained that a dozen readers offered the family free housing, immigration lawyers offered pro-bono assistance, and three film companies are hoping to make a movie of Tani’s compelling story. Though Tani has been offered scholarships to three private schools, his family decided to keep him in his current school, where he learned to play the game that changed his life. They are considering scholarship offers for middle school. Tani’s story even captured the attention of former president Bill Clinton, who invited Tani and his family to meet him in his Harlem office. Instead of buying furniture for their new apartment, the Adewumi family is using the GoFundMe donations to help Nigerian refugees struggling in the United States — as they themselves were not too long ago. According to NBC New York, Tani is preparing for the national championship in May. If he wins, he’ll be the world’s youngest chess champion ever.